Manchester University scientists have created new power-harvesting flags that generate electricity using wind and solar power. 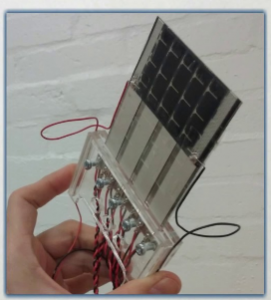 They were developed using flexible piezoelectric strips and photovoltaic cells. According to the scientists, the piezoelectric strips allow the flag to generate power through movement. The photovoltaics does what it does best – harnessing electric power by using solar cells. The Manchester study is the most advanced of its kind to date and the first to simultaneously harvest wind and solar energies using inverted flags. These energy harvesting flags are capable of powering remote sensors and small-scale portable electronics which can be used for environmental sensing such as to monitor pollution, sound levels and heat for example. The aim of the study is to allow cheap and sustainable energy harvesting solutions which can be deployed and left to generate energy with little or no need for maintenance. The scientists have adopted a strategy they call ‘deploy-and-forget’ which they anticipate smart cities will adopt when using remote sensors. “Under the action of the wind, the flags we built bend from side to side in a repetitive fashion, also known as Limit-Cycle Oscillations. This makes them perfectly suited for uniform power generation from the deformation of piezoelectric materials,” intones lead-author of the study, Jorge Silva-Leon. The developed harvesters were tested in wind speeds varying from 0 m/s (calm) to about 26 m/s (storm/whole gale) and 1.8 kLux constant light exposure, simulating a wide range of environmental conditions. The scientists claim that under such operation conditions, total power outputs of up to 3-4 milli-Watts were generated.